Cycling in Mallorca will be wonderful…and the island’s natural beauties are best explored by bike. Picturesque landscapes dotting the length of coastal roads, flourishing orchards, beaches of white sand and green hills await you over the course of your itinerary and will show you a new facet of this Mediterranean island. Whether you’re a professional or an enthusiastic amateur, I can promise you a superb experience. With its fantastic geographical setting, excellent meteorological conditions, unbeatable networks of roads and of course its stunning views of the gleaming Mediterranean Sea… you’ll feel transported to paradise! Do you know what you need to start your adventure? Don´t worry. Here are seven tips for cycling in Mallorca. You only need to get your wheels ready and you’re off! This decision could be the most important for you. All bicycles that are flown need to be registered in accordance with the airlines’ conditions. It’s essential that you check what these are! Otherwise you have the option of renting one when you get to the island. The decision is yours! While it’s true that Mallorca boasts an enviable climate throughout the year, I recommend that you try to come at the beginning of autumn or the end of spring, because this will let you enjoy a mild climate on this marvellous Mediterranean island, which is perfect for cycling. The island offers magnificent conditions to ensure that your stay is an unqualified success, with an excellent network of signposted cycle paths some 1,250 kilometres in length. More than half of the paths are on secondary roads, meaning that you can explore the island away from the beaten track. Fancy stopping for a break at the beach? No problem, because nowhere is more than 40 kilometres away from the sea. Now you have no excuse not to come! Whatever you do, don’t forget your swimming costume: while cycling the length of Mallorca’s stunning coast it’s easy to find little coves, ideal for swimming undisturbed and relaxing on the fine white sand. The world will be at your wheels! Better safe than sorry…If you decide to visit the island at a time of rains and strong winds you should take great care to avoid falling. I recommend that you keep a close eye on braking distances, adopt a central position in your lane and reduce your normal speed. Much better than being wise after the event! The bicycle routes on the island’s eastern and southern coasts are especially picturesque, but the quiet inland region can also be explored by bike. There is a well-established network of roads and cycle paths with good signage. Many tour operators offer cycling holidays and direct tours, so don’t hesitate to check them out beforehand. If you’re a beginner or keen enthusiast, the best routes for you are to be found on the great plain of Mallorca and the south-east coast. If you’re a professional on the other hand, the Sierra de Tramontana with its steep ascents is the ideal place for you. Superb for sharing moments with your family! A wonderfully-located cycle track on the coast for beginners or families with children. If this applies to you, it’s an ideal route that can be completed in just one hour. You’ll revel in the delightful tracks that lead directly to this earthly paradise. Touring this natural park provides some magnificent views in a setting of total tranquillity. Located just four kilometres from this marvellous place you’ll find various species of birds, detailed information about which is available at the visitor centre. The beauty of nature will inspire you! If you’re a professional cyclist this is the perfect route for you. The ascent of the Sa Batalla pass has many sections with extremely steep gradients. The route traverses the heart of the Sierra de Tramontana, which UNESCO has designated as a world heritage site. Dare to explore the landscapes of Mallorca! This is one of the toughest routes on the island! In the first section you’ll enter the natural park of the Llevant peninsula before reaching Cala Mesquida…and as if that were not enough, in the second stage you’ll be able to revel in the stunning Oratorio de Sant Salvador. This climb is only for the brave: 4.5 km at a 7.6% gradient without any respite. Think you can overcome it? Mallorca has few rivals as one of the great destinations for cyclists and the hotels have also adapted themselves to the cycling boom: tours, bike storage facilities and much more besides. Everything is designed with your needs in mind! VIVA Blue & SPA. The paradigm of hotels for sports-lovers, featuring a full range of facilities so that you won’t lack anything during your holidays. 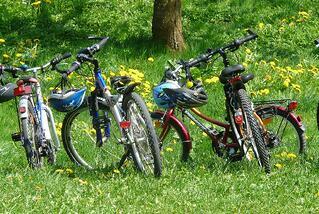 Bicycle storage, a cycle training camp ideal for those who don’t want to stop pedalling! VIVA Sunrise. If you want to do some cycling but also combine it with a family holiday, then this is the perfect hotel for you: it allows you to do both things thanks to activities for the little ones. Wonderful, don’t you think? Vanity Golf. An idyllic place to indulge in peace and tranquillity at the same time as engaging in your favourite sport. There’s also the Balneum Centre, which after your sporting exertions will leave you feeling like new. If you follow these tips I’m sure you’ll have a wonderful holiday engaging in your favourite sport onthis marvellous island. It’s undoubtedly a paradise on earth for cycling!